For use with a fan with light. 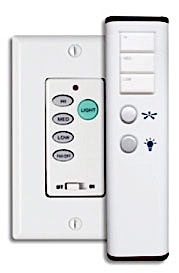 Includes a remote control and wall control with three speeds per control and light on/off and light dimming. Includes receiver, handset holder and switch plate.